Make the holiday season a little sweeter with these delicious recipes. 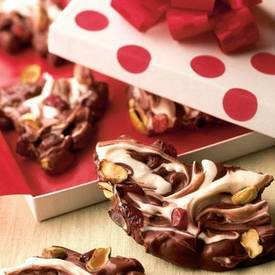 For an extra treat, write down the recipe and include it with your gift. Once you've sampled this melt-in-your-mouth confection, you'll be tempted to fill your own candy dish with it instead of giving it away as gifts. Best to plan on making a couple of batches from the start. Just enlist a young helper--swirling the white and semisweet chocolates is a particularly popular job--and package the finished candy in see-through cellophane bags to show off the mouthwatering goods.